A great loss. I hope his family are able to "build" after this loss. Deep, intelligent and handsome. So many are affected by Leonard's loss. All the very best to his family and friends. He obviously loved you all. It was a mild day for mid-November in Montreal when Leonard Cohen’s funeral was held last Thursday in the city he always considered home, even after years of living in Los Angeles. One of his best songs, In My Secret Life, included the words “I know what is right/And I’d die for the truth.” And in the end, those lyrics segued into Cohen’s secret funeral. About 15 people attended the graveside ceremony and burial in the Jewish section of Mount Royal Cemetery. “As Leonard requested, there were only a few old and close friends,” said Robert Kory, Cohen’s L.A.-based manager. He said Cohen wanted his funeral to be simple, absolutely traditional and in compliance with Jewish law, with the body placed in a casket. In late September, Cohen told a friend – another former Montrealer living in L.A. – that he had only six weeks to live. That turned out to be accurate. Amazingly, though Cohen died before dawn on Tuesday last week, Kory was able to work closely with the rabbi, the cantor and others to keep the funeral plans secret for more than two days. In fact, Kory had been taking good care of Cohen for years. The poet and musician had turned to Kory after discovering – thanks to the suspicion of his daughter, Lorca – that Kelly Lynch, his former manager, had been defrauding him. Lynch was charged and jailed, but efforts to recover Cohen’s money were unsuccessful. Kory knew that going on the road was the best way to bring enough money into Cohen’s bank account to take care of his family for the rest of his life and after his death. Kory promised to set up the tour in a way that met Cohen’s need for privacy. Occasionally he would accompany Cohen to a city where he was performing, but more importantly, he would set the rules and values for the support team on the road. One of the key rules concerned sound checks at each concert venue. Most important of all was Kory’s edict of no visitors before or after any concert. “Is that really possible?” Cohen asked him. Indeed, Kory declined even well-known artists who wanted to see him. When they began working together, Kory recalled, even in New York, he and Cohen could stroll down Broadway after a show with no problem. In more innocent times, he was our guide to intimacy. For someone coming of age in the 1960s, attempting to be a writer, or a lover, Leonard Cohen was essential. Even as a young man, he had the wisdom of an elder, an alchemist mixing the sacred and the profane into an inky love potion. “Suzanne” was the first and last song I tried to learn on guitar. “So Long, Marianne” sanctified my first foolish glimmer of a broken heart—after I’d spent a chaste night in Europe with a girl named Marianne who agreed to get naked but never wrote back. I was 17 and writing bad poetry. I never dreamt I’d someday meet Leonard. But over the last 25 years, I had the privilege of interviewing him for this magazine numerous times. Our professional relationship led to a few casual dinners, and even some collaborations—he contributed performances to three films I’ve made, most recently the documentary feature Al Purdy Was Here. I didn’t take this for granted, but felt incredibly lucky. Of the countless stars I’ve met in my line of work, no one has had a more profound impact on me. And no one gave a better interview. The first time we met was in a Toronto hotel, in 1992. Leonard was on a 17-country talking tour, promoting his album The Future. Speaking in finely tooled paragraphs, he described the ordeal of creating an album: “Layers of friendship fall away, and you know that you’re in it when you’re not doing anything else but trying to find the rhyme for ‘orange.’ It doesn’t exist. Some people say it’s ‘door hinge,’ but that’s not right.” As I left, he thanked me profusely, as if I had just joined his army, and I floated out onto the street feeling special. I was chagrined to see the no-rhyme-for-orange line appear in another interview, but came to learn that Leonard treated publicity as a ritual that required a polished repertoire. What mattered is that face-to-face he was so utterly present, respecting the moment as if it were as valuable as any other. He recalled how he once passed out in that kitchen for some unknown reason, and woke up bleeding on the floor. He pointed out the spot where his head had splintered a shelf, and how he had mended the wood, almost invisibly. By the time enough wine had been drunk and it seemed polite to leave, Leonard said, “Not so fast.” Eventually he led me back to the studio behind the house with Anjani Thomas, his partner at the time. In this enclave of dark wood and Persian rugs we sang along to Irish folk songs stored on his computer. While he often pined for Montreal, and chose to live in L.A. to be close to his children, Adam and Lorca, he seemed to appreciate the rich ironies of America. He laughed about visiting Las Vegas, spending most of his time drinking espresso in a café overlooking a canal in a replica of Venice, under a sky permanently set at magic hour. What often got lost in Leonard’s image as “the grocer of despair” is that he was no stranger to bliss, and was persistently funny, even about the most serious matters. He was a Jewish comedian with the offhand delivery of a Zen priest. His smile was a mile wide. By the time I got to know him a little, his lifelong depression had mysteriously lifted, so that may have had something to do with it. But even the title of his final, funereal album, You Want It Darker, was engineered to elicit a laugh. That was in the days before the depression lifted. Without becoming a novelist, he had written two remarkable novels as a young man. And near the end of his life, he would revisit poetry, which he once told me was “a verdict rather than an intention.” When Bob Dylan won the Nobel Prize in Literature, Cohen fans protested that their man was the more serious poet. Leonard just said that giving Dylan the Nobel “is like pinning a medal on Mount Everest for being the highest mountain,” a sly compliment that could be taken either way. Marni never did get to meet Leonard, but he would remain an enduring presence, even cropping up as a key character in her recently published book of fiction. It seems that every fan feels a private and permanent connection to him, which helps explain how his audience grew larger than ever in the last years of his life. In the past week, as people shared their memories on Facebook, I realized my experience with him was not exclusive. One journalist remembers Leonard making him a chopped-egg sandwich, another (a woman) was offered a bath. But sometimes the powerful intimacy does not occur alone in a room. The last time I saw Leonard was with thousands of other fans in Toronto during his final tour. Midway through, the band fell silent, and he recited a poem, one that had formed the basis of his song “A Thousand Kisses Deep.” To feel a hush descend over a hockey arena as Leonard’s voice breathed life into a poem about longing and death was enough to make a grown man cry. The heart will not retreat . . . It was a marathon concert, and as the encores continued, Leonard told the crowd that they should feel free to leave at any time, and just “give me a little wave” on the way out. Allowing us to leave him before he left us. So as the music played, we waved farewell and carried his song into the night. So so heartbroken. Leonard you made the world a lighter place, and now it feel so dark. I will never forget you or your songs. My deepest condolences to his family, friends, and all who were touched by him. He gave the world his gift and his energy will remain in all of us who seek it. The Grand Concerts in the sky. 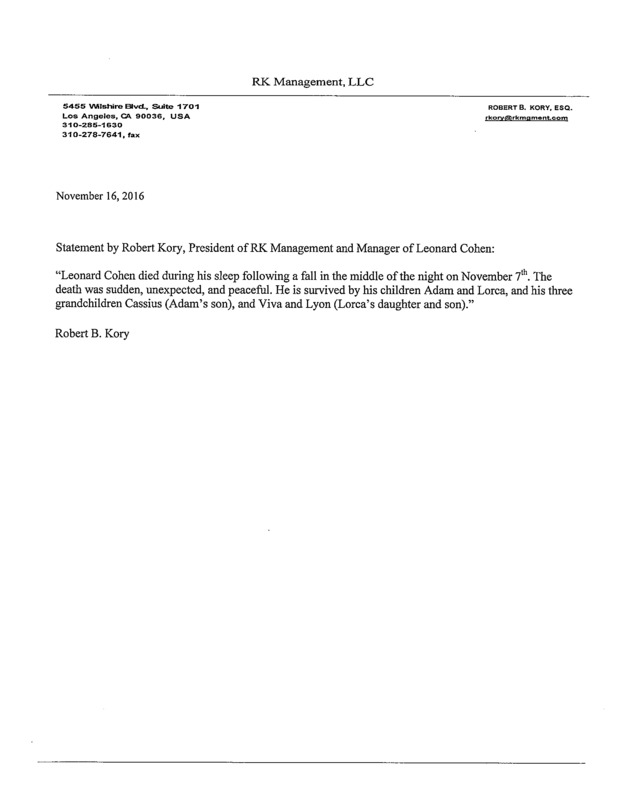 I noticed in Robert Kory's announcement that Leonard leaves a third grandchild. That is beautiful news, and the child is named for Leonard's grandfather Lyon Cohen. It seems that Lorca has either given birth to or adopted another child. Blessings on the entire family. The news is finally sinking in to my brain after almost a week. I am listening to Leonard's songs and he is giving me comfort from beyond. Oh my, that makes it even sadder (if that's even possible)!! Because, of course, it means that he might have had more time if that didn't happen. But who knows, maybe that did have to happen, according to some mysterious plan that is beyond our capacity to comprehend. . .but whether it had to happen or not, it does feel quite disturbing... Thank you for posting Robert Kory's message, Jarkko. I also have to make a correction: in my previous post, I said that a unique & brilliant flame has now been blown out; in my state of intense shock & sadness, that is one of the thoughts that came to me. But, although my heart is still overwhelmed with sorrow, & everyone already knows what I am about to say, I still feel compelled to apologize for that statement & correct it; because, although Leonard's physical presence is no longer here with us, the giant, brilliant flame that was & is Leonard Cohen, lives on forever, in this world & all other worlds, & especially in all of our hearts. Deepest condolences, again, to Leonard's family & friends; I can't imagine a greater loss in the whole world, from the beginning to the end of time, & you are in my thoughts & prayers. holydove wrote: Oh my, that makes it even sadder (if that's even possible)!! Because, of course, it means that he might have had more time if that didn't happen. But who knows, maybe that did have to happen, according to some mysterious plan that is beyond our capacity to comprehend. . .but whether it had to happen or not, it does feel quite disturbing... Thank you for posting Robert Kory's message, Jarkko. Yes for sure there will always be a 'brilliant flame'. LEONARD Cohen was in "deep pain" caused by cancer before he died. The 'Hurricane' hitmaker passed away at the age of 82, and although no exact date and cause of death has been confirmed, it has been claimed that the iconic musician was suffering from the disease and had been physically debilitated by the illness. David Remnick - who interviewed Cohen in the summer for The New Yorker magazine - said during The New Yorker Radio Hour on Thursday: "When I visited Cohen in Los Angeles he was suffering from cancer although he was keeping that very private. He was in deep pain from compression fractures in his spine and he had to sit in a big blue medical chair to ease that pain. I have just read the Los Angeles Times interview with Jennifer Warnes , and I am moved by how Leonard's kindness could touch other people's hearts - a powerful and touching love story.